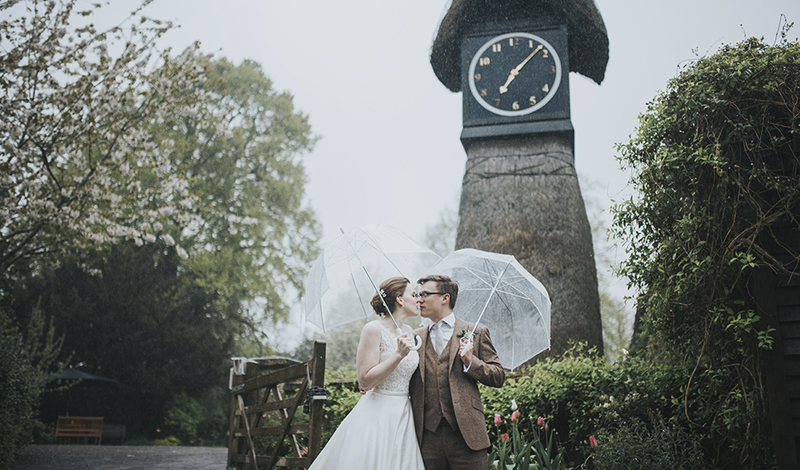 Sarah and Joseph’s spring wedding might have been a rainy day but it was definitely a day to remember. Their woodland themed wedding at Clock Barn was utterly perfect for a couple who love the great outdoors. 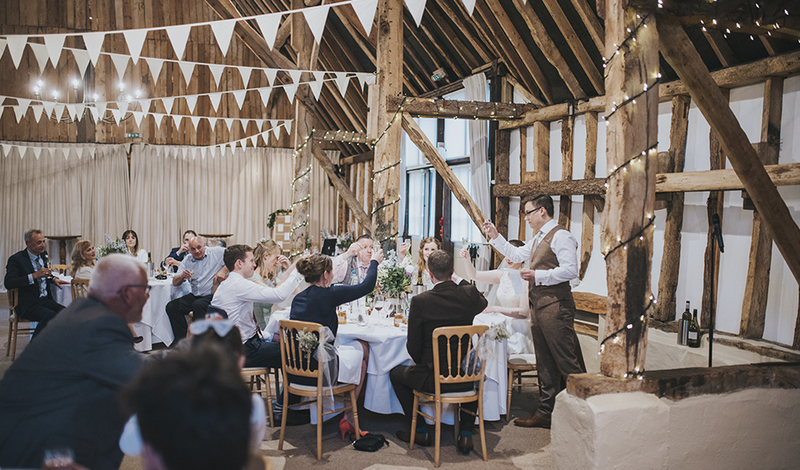 “The venue is absolutely stunning, set in the countryside in the middle of nowhere and the barn has been beautifully decorated throughout. We wanted a venue that would allow us to have the ceremony and reception in the same location.” – Sarah. 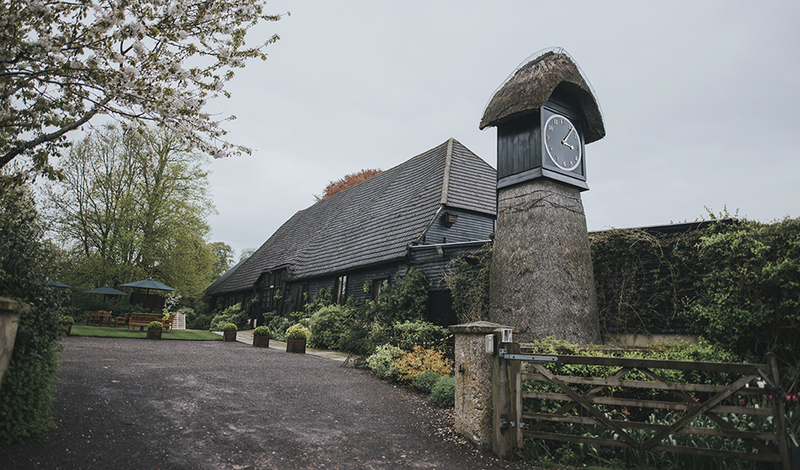 “When we first visited Clock Barn, even though it was a wintry February evening, we were taken aback by the venue, what it had to offer and the professional, thoughtful staff.” – Sarah. The couple wanted their wedding to be a true representation of their lives together and of themselves. 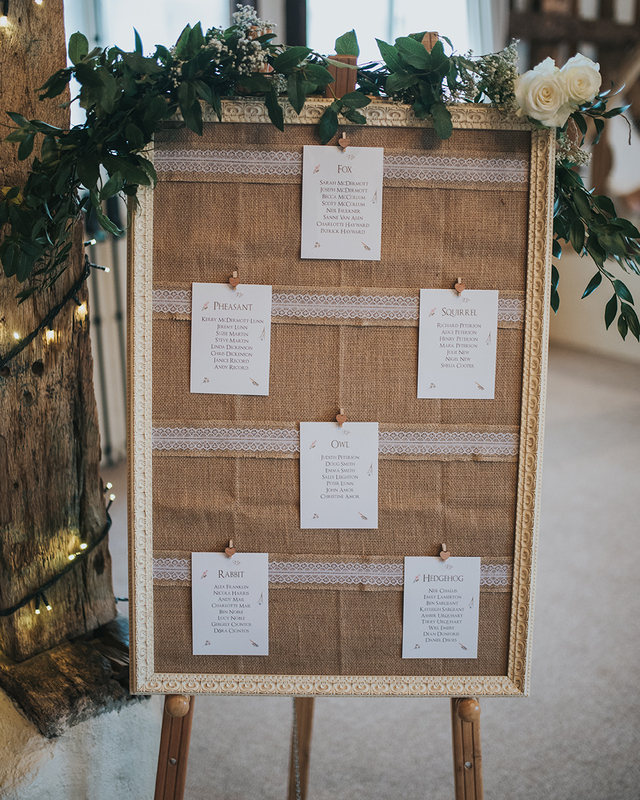 Their love of the countryside inspired their woodland theme and all the decorations were collected or made during their year of wedding planning. “We chose a sage green palette as this fitted with our theme and, as our wedding was in April, we decided it was a soft spring colour. Not only that but it also really suited both of our bridesmaids!” – Sarah. Sarah and Joe totally transformed Clock Barn. 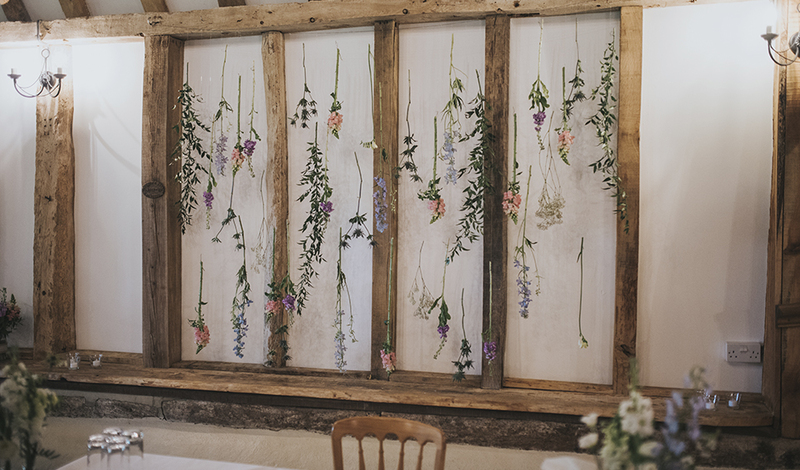 There were suspended florals in the ceremony room, wooden crates with photos flowers and a large model rabbit at the entrance to the barn and hundreds of jam jars with flowers all around the barn. 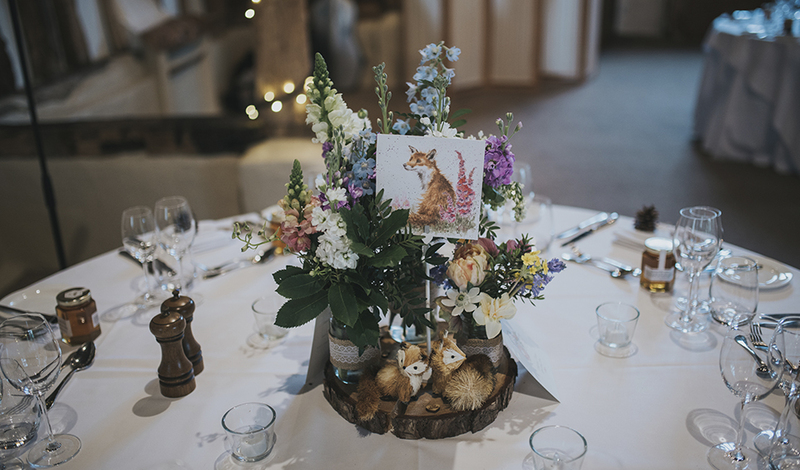 “There were also pine cones at each guest’s place setting and each table was named after a woodland animal. Our favours were jars of honey – my Dad is a beekeeper and he produced, bottled and labelled the honey for us.” – Sarah. 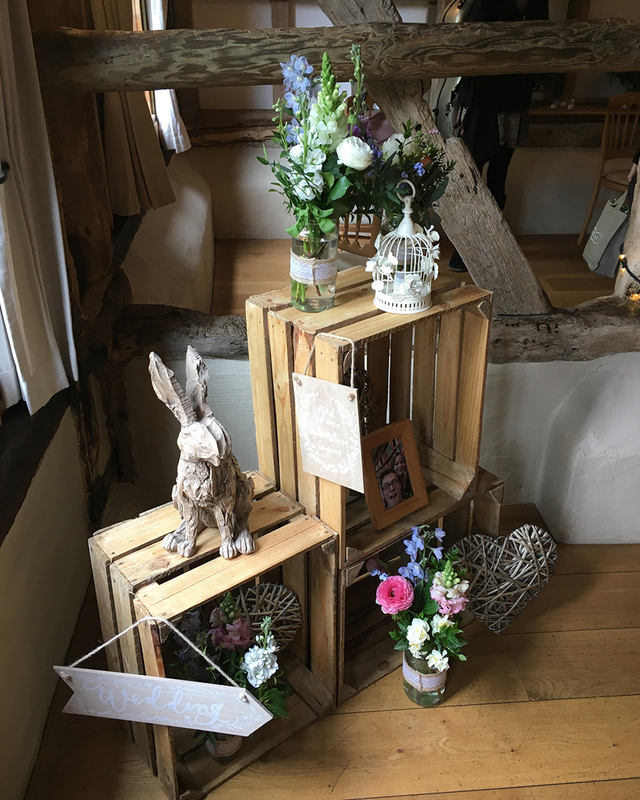 “We were also thrilled with our flowers and we were very fortunate that one of our bridesmaids, Charlotte Hayward, is an extremely talented florist. We love her natural style and this was perfect for our day. The flowers were so beautiful that we didn’t want to waste them so I asked my bridesmaids to give them to guests as they left.” – Sarah. “It wasn’t the style I thought I would have! I tried on lots of dresses at bridal boutiques but struggled to find ‘the one’. However, when I found this dress, I loved it! It was very big with a huge train and I thought it was fun. 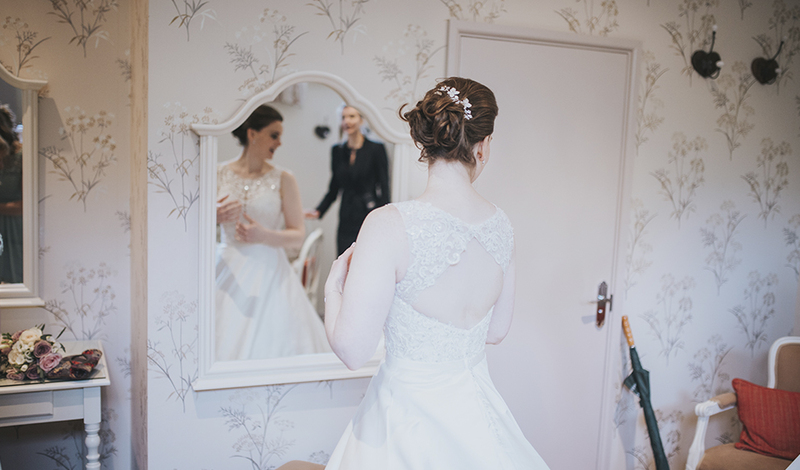 I loved the detail on the bodice and the gown had pockets, which was different.” – Sarah. Sarah added a selection of beautiful accessories to her look. Her Ivory & Co earrings were a gift, given to Sarah by her friends on her hen do and her fabulous headpiece, also from Ivory & co, was a birthday present from her sister. Sarah also borrowed her sister’s veil and pinned a 1950s brooch to her bouquet. For her ‘something blue’, Sarah sported baby blue toe nails! 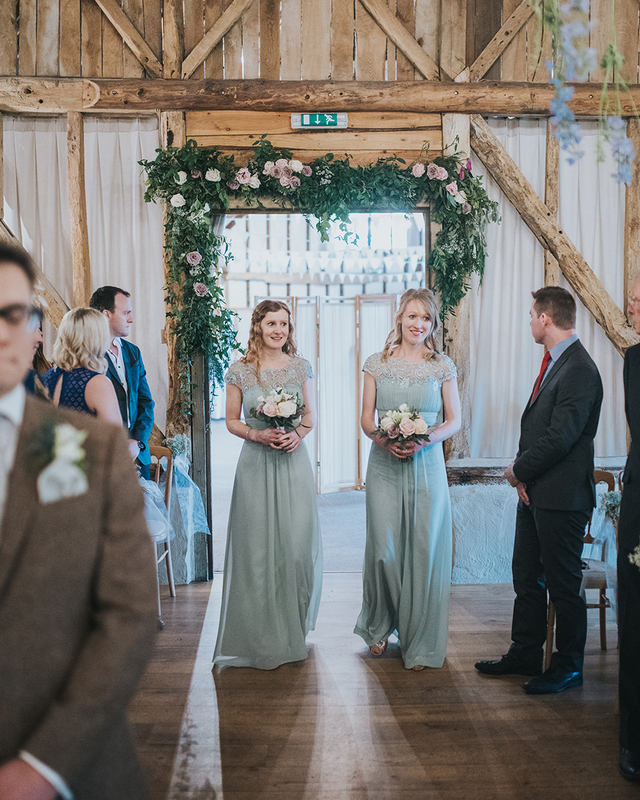 To complement the wedding colour scheme, Sarah’s bridesmaids wore long sage green gowns and dusty pink shoes from Pink by Paradox. Joe looked every inch the gorgeous groom in a light brown tweed three-piece tailor-made suit from Victor Valentine. 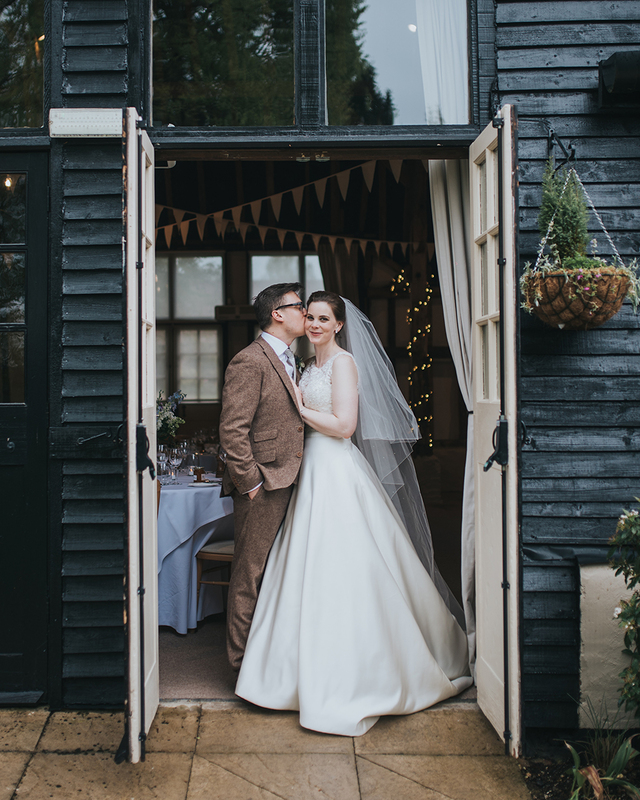 After Sarah and Joe’s marriage ceremony at Clock Barn, the celebrations began with drinks and canapes. 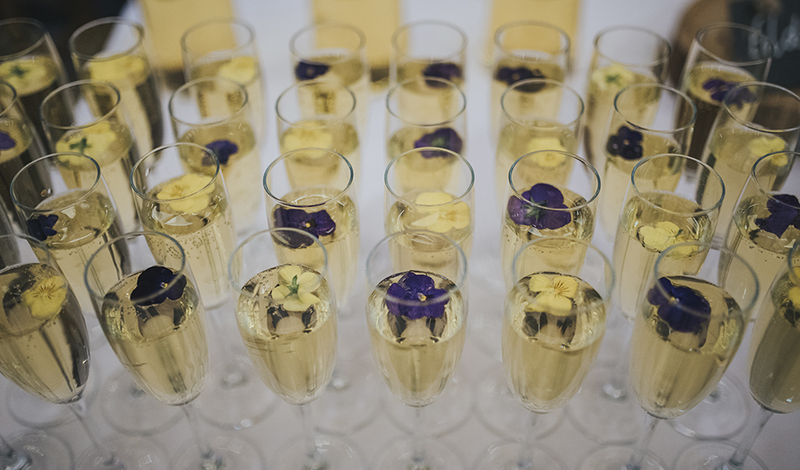 They served Elderflower Cosmopolitans and Elderflower Sparklers as the non-alcoholic option and guests enjoyed smoked chicken and watercress crème fraiche tartlets, Italian inspired skewers, marinated king prawns with grilled fennel and ricotta and spinach tartlets. 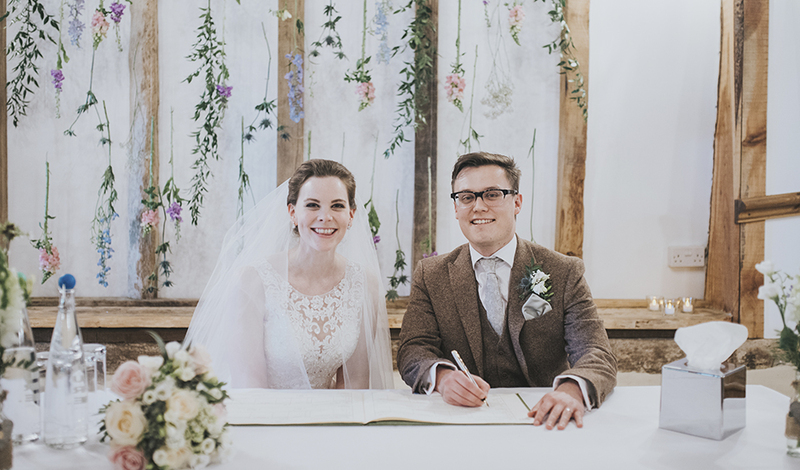 Sarah and Joe were announced into their wedding breakfast by Sarah’s brother-in-law who acted as toastmaster on the day and the wedding feast was another triumph – smoked bacon Scotch egg was followed by fillet of beef and a trio of desserts. Vegetarian options included a starter of crisp baked polenta and roasted butternut squash with a three-bean salsa and mature Cheddar crust for the main course. “The food was amazing and the beef was outstanding, probably one of the best I’ve ever eaten – it was so tender and perfectly cooked. Everyone commented on the incredible food and the service was impeccable. The staff were extremely attentive.” – Sarah. 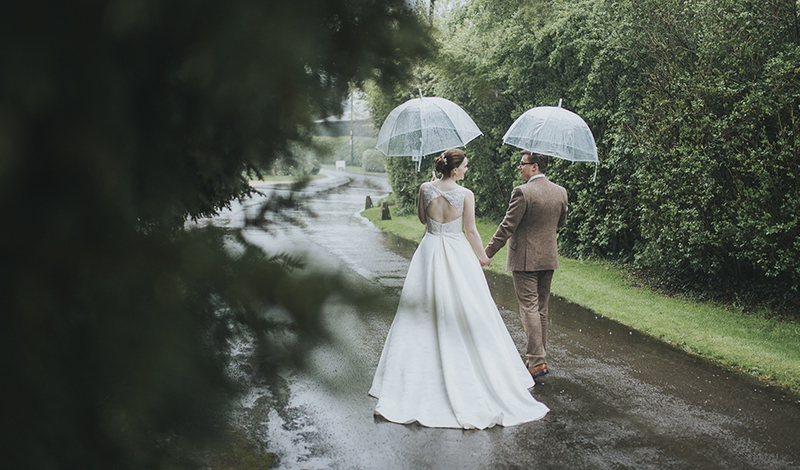 The day was rainy but Sarah and Joe did brave the elements with the help of bridesmaid and groomsmen carrying her gown and holding umbrellas. “My train was on the ground throughout the photos so it got drenched. Back inside, I stood by a heater which fanned out my dress! This was just as a large group of evening guests arrived so their first sight of me was an entertaining one!” – Sarah. 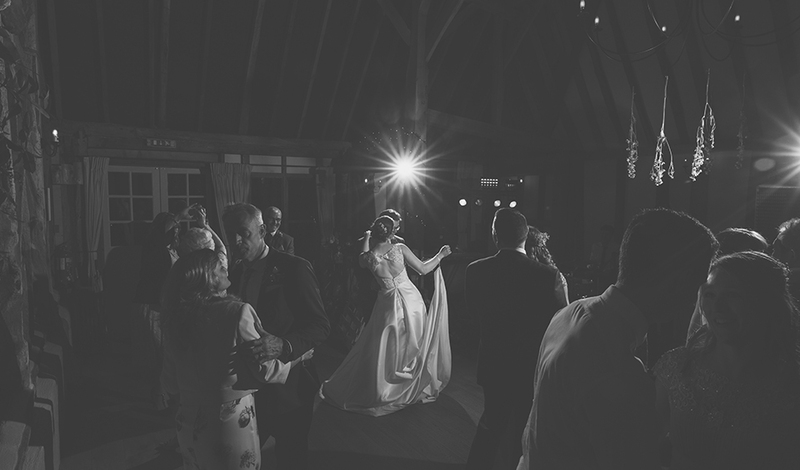 Sarah and Joe started the evening party by taking to the dancefloor for their first dance to ‘You’re My Best Friend’ by Queen, played by the band, Hydra. “Our friends organised a photo guest book for us. All the guests took photos and printed the photos then added a message for us. 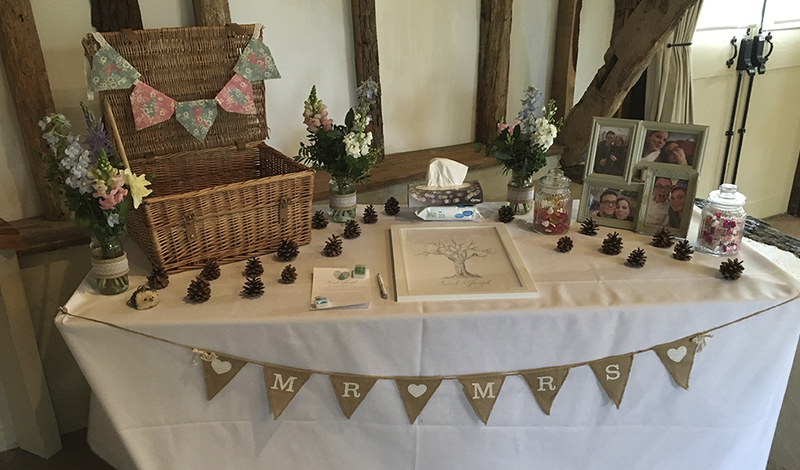 This was a wonderful surprise that our friends arranged with Clock Barn without us knowing!” – Sarah. After enjoying woodfired pizza, guests also went home with slices of delicious lemon sponge wedding cake, made by Sarah herself. “It rained on our wedding day so we weren’t able to get outside for the confetti shot when we’d planned. So, we had a confetti send-off at the end of the night instead.” – Sarah. “If you’re planning your wedding, I would say don’t do anything to please family and friends. It’s your wedding so be yourself and let the wedding reflect that. Our guests commented on how personal our wedding was as it really was all about us as a couple.” – Sarah. “No matter how much planning you do, there’ll always be one or two unplanned things that crop up but in the end, they don’t matter. Just enjoy the entire journey of planning the wedding and the day itself. 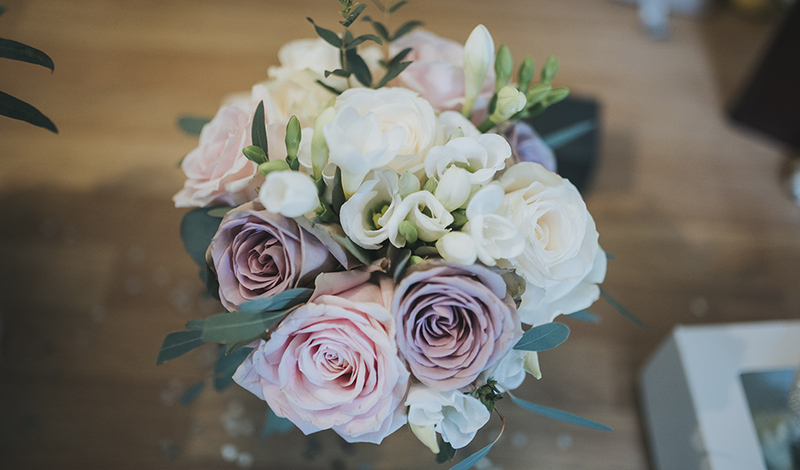 However, I didn’t anticipate just how tiring the day would be so make sure you get enough sleep in the weeks leading up to the wedding.” – Sarah. For the perfect night’s sleep, take a look at the luxury wedding accommodation on offer at Clock Barn and don’t miss our look at the best wedding trends for your 2019 celebration either.